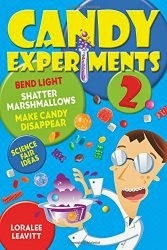 Candyfavorites.com just launched a Candy Experiments giveaway, with signed copies as prizes. There are lots of ways to enter, but my favorite is to send in your own idea for a candy experiment. (I can't wait to read them!) Here's the entry information. Also, CandyFavorites.com recently donated some Pop Rocks to the candy experiments cause, and we had a ton of fun here experimenting with them. Watch next week when we reveal our discoveries on candyfavorites.com!